Very troubling words if you’re banged up in jail, but very enjoyable if you hear them sung by a great band to a tuneful melody. 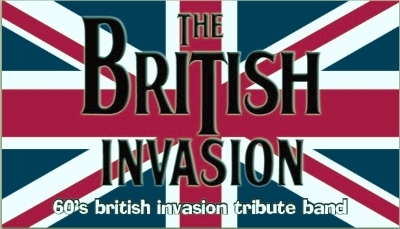 We recently heard about The British Invasion after they were scheduled to perform at Taste of the Kingsway last month. It’s always good to be able to listen to some music from the time when you could take your gal to the local hop, grab a pie and beer, a film and late-night kebab and still have change from a fiver. Good times. We read on your website the band was formed in 2011 with a former classmate — how did you guys decide Josh and Alex were the right fit? Not a former classmate, but with a friend who went to a different school at which a mutual friend introduced us. Thus started the musical relationship. My last tribute band to the UK ’60s disbanded in 2010 (no name). Soon after, my father was diagnosed with brain cancer and I dropped out of the music scene altogether to help take care of him. I then decided that staying away from music was actually counter-productive. So in March of 2011, I put an ad in Kijiji asking for a “Harrison” and “Ringo” type of players to join this project (now The British Invasion). I had several other people contact me and Jerry and I auditioned all of them. The e-mail I received from Alex was an interesting one. Here’s what he wrote: “I’m English, I eat Indian food, and I play guitar.” I later called him and we spoke about a drummer friend of his whom Alex said we would be impressed with. So in April of 2011 we set up an audition with Alex and Josh. Little did we know, they were auditioning us as much as we were them. We originally asked them to learn 12 tunes. The day before, Alex e-mailed me and asked if we could do six because they had another appointment (not so). We found out later after an hour audition/rehearsal that both had been to many other auditions in which they were teaching the band members the songs they had learned for those auditions. That first meeting proved to be the recipe to the creation of The British Invasion. Your website lists some of the bands you cover — how do you decide which ones (or songs) to add? We are constantly changing songs and attempt to balance them out in order to appeal to the crowd’s tastes. Also, if they sound good and we like them, we believe the crowd will like them as well. How do you do promotions/publicity and get your gigs? Lots of telephone, e-mails, and letters!!! At this point, a lot of our gigs come through word of mouth and also people approaching us to book us while we’re at our gigs. No shortage of work for The British Invasion! Do you still find time to practise or have it down pat now? We are constantly practising, mostly on our own first for new songs and then adding group practices. However, any of the songs we have worked on these past four years, we pretty much have them down. Any funny gig stories to share about life on the road? Well, from time to time people do act silly when they have had too much to drink. A couple of us have had bras thrown at us — a result of drinking too much — not us, them! Any and all that invite us to perform! This entry was posted in Uncategorized and tagged brits in toronto, the british invasion on October 7, 2015 by britsintoronto.